Editorial cartoonists from across North America will meet at the Ryerson School of Journalism this weekend to grapple with issues of censorship, intimidation and other challenges they face in the course of doing their work. 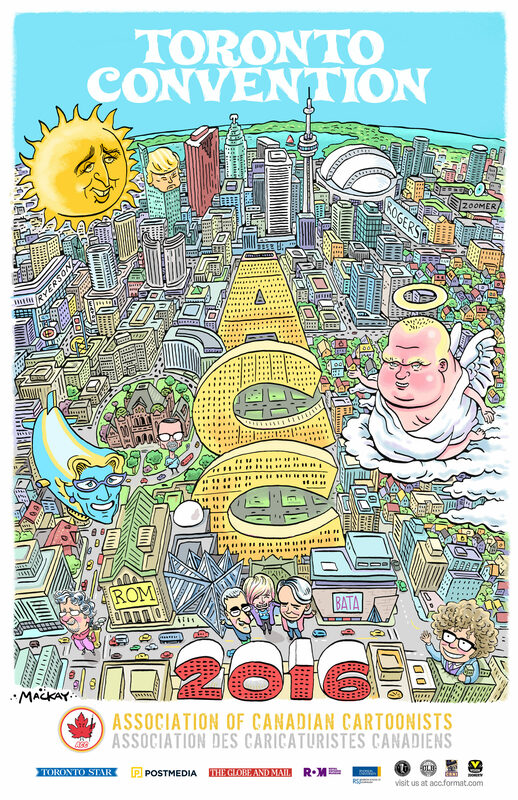 The 2016 convention of the Association of Canadian Cartoonists/Association des Caricaturistes Canadiens (ACC) is meeting in Toronto for the first time in more than a decade. The biannual event will bring together prominent members from the cartooning community in Canada and abroad, including 2016 Pulitzer Prize winner Jack Ohman of The Sacramento Bee. Together with the Ryerson Journalism Research Centre, the ACC will hold two public presentations that are free and open to the public at the Rogers Communications Centre. The lineup for the morning of Friday, May 6, includes Christian Vachon, curator of The McCord Museum in Montreal; Shahid Mahmood a Toronto-based political cartoonist who has been been fighting to get his name removed from the U.S. no-fly list; and Nik Kowsar of Cartoonists Rights Network International will join former Vancouver Province political cartoonist Dan Murphy for an update on global CRNI issues. On Saturday morning, Ohman will join fellow Pulitzer Prize winner Ann Telnaes (Washington Post) to discuss editorial cartooning and the U.S election. They will be joined by Université du Québec à Montréal professor Dominic Hardy who will talk about the history of cartooning in Quebec. There will also be a Q&A session with American caricaturist Philip Burke, whose work has appeared in Rolling Stone, Vanity Fair and The New York Times among other publications. The editorial cartooning community is small and getting smaller as members have retired, lost their jobs or left the business, said Tyrell. Add to this the technological changes involved in producing work for publication, he said, and conferences like these become more important each year. The presentations are an opportunity for student journalists and aspiring artists to learn more about editorial cartooning and the powerful impact it can have. A cartoon by the Chronicle Herald’s Bruce MacKinnon captured the grief of a country shocked by the murder of Cpl. Nathan Cirillo at Parliament Hill in 2014. It quickly went viral and appeared on television broadcasts and news sites across the country. The convention allows journalists to address these issues together, including how to grapple with the new and sometimes dangerous environment in which they’re publishing. The convention runs until May 8 and coincides with a Royal Ontario Museum exhibition of original editorial cartoons from before Confederation to the present. “Point & Punch: Historical Editorial Cartoons of J.W. Bengough (1851-1923) and Sam Hunter (1858-1939) runs until Sept. 18.